Good news! 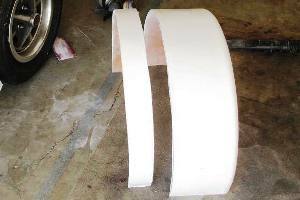 Our rear fenders arrived. This has kept us busy for most of the past week, which means another week with no painting! Or at least no messy painting. We were able to paint a few little pieces like the headlight bar and fan mounts, which are small enough to shoot with a spray can in the back of the house. But that kind of painting is merely irritating, as opposed to shooting entire body panels, which can be painful. Installing fenders was easier. Although not a lot easier. Each fender comes in two parts. 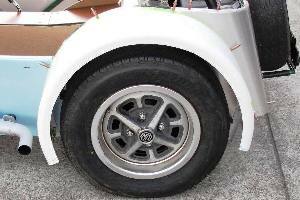 The first is an aluminum flange that bolts or rivets to the body panels. 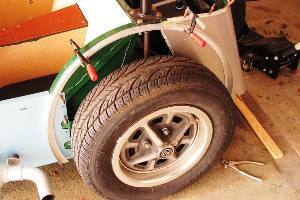 The fender itself is then bolted or riveted to the flange. The decision to use bolts or rivets is unfortunately left to us, which is sort of like options, except without any clear direction on which option may be best. Bolting is probably better, because it lets you change things when it turns out you made a bad choice, but riveting might be stronger since it spreads the load better, assuming you're not planning to use 40 or 50 bolts to attach the fender. Bolts are also a lot more visible than rivets. If you bolt the fender to the flange, it's going to show. Obviously you have to use bolts somewhere. You can't rivet both the flanges and the fenders, or else you'd never be able to take the fenders off. Ever. It seems to make sense to bolt the flange to the body, where the bolts will be hidden by the fender, and rivet the fender to the flange. For an even more finished look, you could countersink the rivets and putty them over, if you weren't as lazy as we are. But first things first. The fenders needed a little trimming before we could bolt them on, because they're made to fit cars with tires up to a foot wide, and even on their best day our tires are a little narrower than that. So we had to cut the fenders down to size, and since they're made out of fiberglass, that meant wrapping ourselves up in duct tape and sheets of plastic and working out in the back of the house. 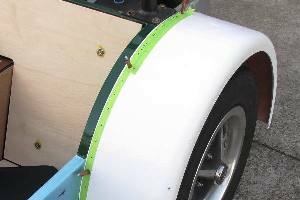 The first thing we did was slice 3-1/4" off of the inside edges of the fenders, and then we trimmed the sides to a height of 1-3/4". More or less. 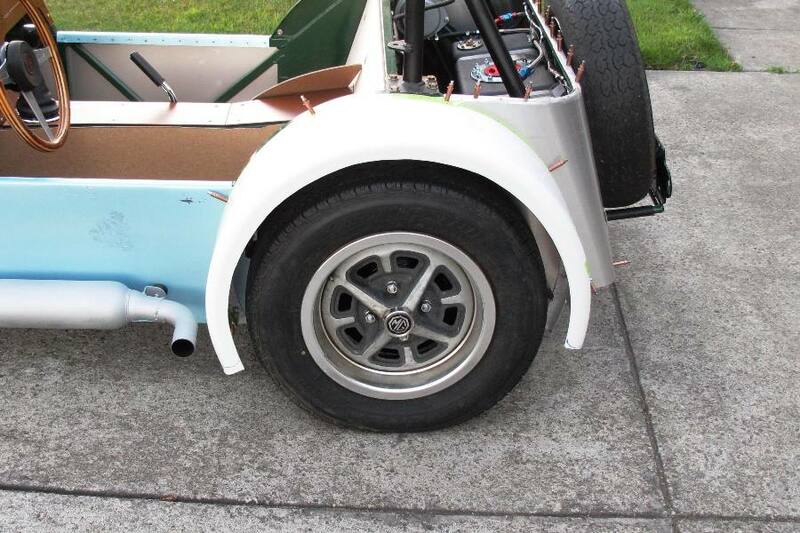 That will leave about 2" between the top of the tire and the bottom of the fender, a gap that may offend the hellaflush crowd, but considering this is a replica of a 1963 Lotus 7, and in 1963 the hellaflush crowd's parents weren't even born yet, we're okay with it. To actually mount the fender, we first had to drill holes in our new bodywork so we could mount the flanges. This wasn't as difficult as you might imagine, because over the years our expectation of professional results has taken such a severe beating that we're willing to accept almost anything these days, so long as it works. We looked to the Locost book for guidance on attaching the fenders, but it only said to bolt them on with small nuts and bolts and large washers to spread the load. No information on the number of bolts, but since it referred to bolts, plural, we can assume at least two. Although they could've meant one per side. But probably not. We used six per side. And big 1/4" bolts, too. By drilling the holes now we are of course trusting that our bodywork clecos are securing the panels in the exact same position that the rivets eventually will. 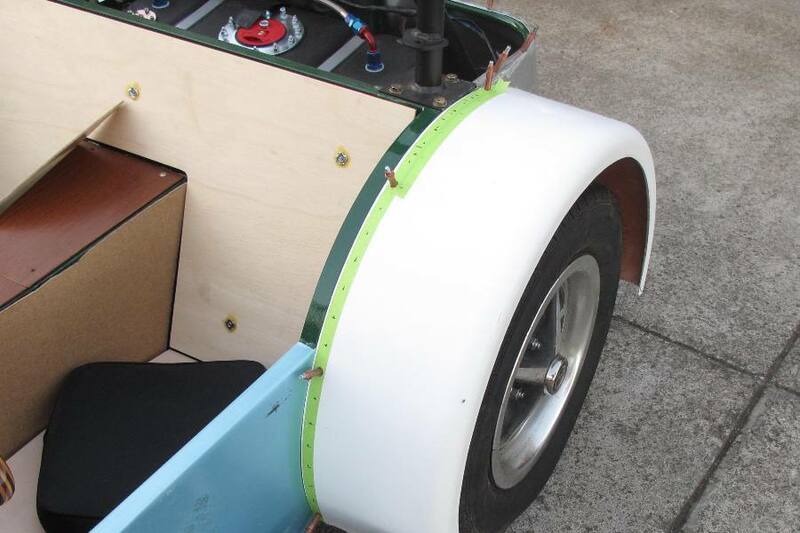 Somehow it worked out that the inside edges of the fenders perfectly matched the curved fender supports that we welded on to the chassis sometime last year. This is not a feature of every Locost, although according to the Locost book it's supposed to be. I'm not sure what that says about our build, but we're chalking it up to coincidence. Or luck. Or both. Of course it's also possible that if you just blindly follow directions and do what you're told, things will just work out. Unlikely, though, as we've clearly demonstrated on far too many occasions. We're still undecided on the bolts vs. rivets debate, and so at this point we've only clecoed the fenders to the flanges in six places. Even if we go with rivets, we're not sure what kind to use, and whether or not we're feeling ambitious enough to countersink them all. 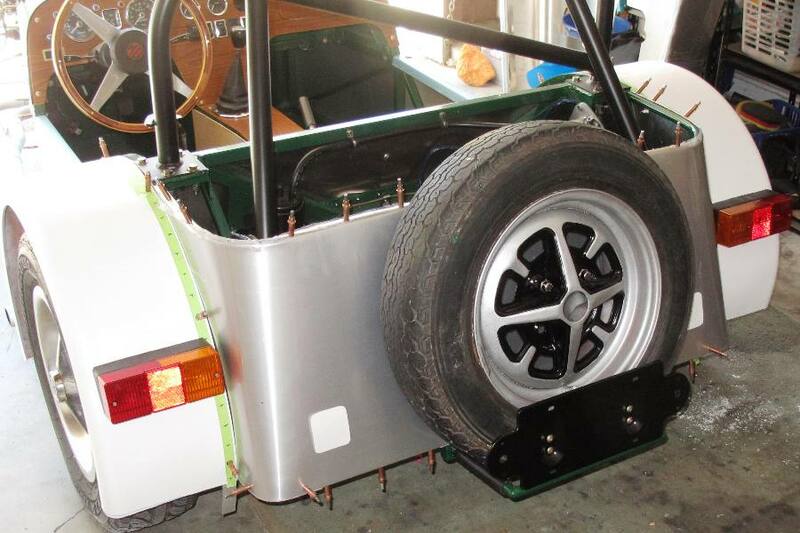 But six clecos are more than enough to hold the fenders in place for now, allowing us to fit our cool new Britax taillights, which happen to be the exact same units fitted to Caterhams, which is something we probably mentioned before, and are not likely done mentioning now. The height of Locost taillights is critical. Unfortunately we don't really know what that height is. So we conducted our usual diligent research, which consists of reviewing the first couple of pages of Google images, and then guessed. We came up with a measurement that put the bottom of the lights 18" off the ground. We took pictures of our mounted taillights, and posted them here, so they'll eventually show up in Google images where they'll provide yet more evidence for the next group of builders that Locost taillights should be 18" off the ground. In the end, determining the proper height for the taillights turned out to be less important than actually getting both lights mounted at the same height, which was considerably more difficult then looking through images on Google. We think we're close, or at least close enough for photographs. 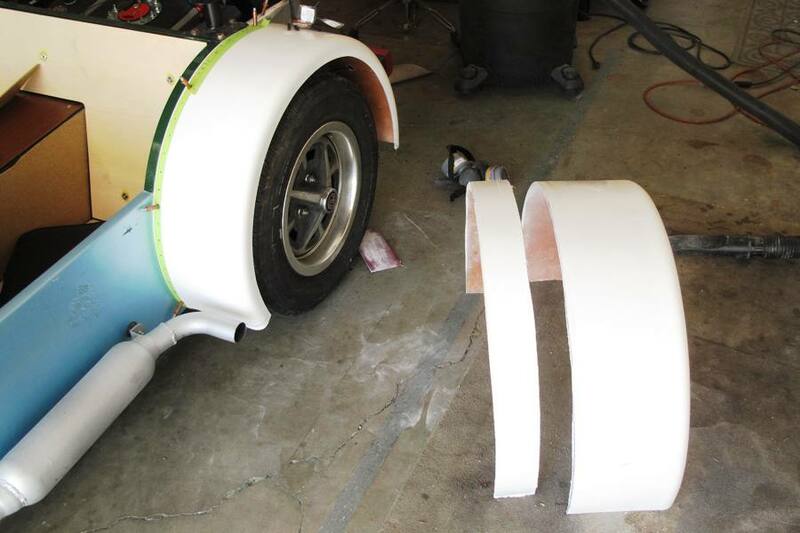 So with the rear fenders basically done, we're back to where we were a week ago, with nothing left to do except paint.